An imaginative Japanese historical work is the vibrant highlight of this program consisting of four other variable and worthy short plays. Double Suicide at Ueno Park! by Leah Nanako Winkler was the final and the most vibrant of the five works presented at the Ensemble Studio Theatre’s 35th Marathon of New One-Act Plays: Series C.
In Old Japan, two 12-year girls who have been sold into prostitution by their families form a deep friendship amidst the horrors of their plight as time passes. Yoshiwara the brothel wherein we are trapped? 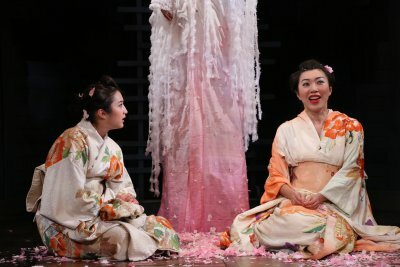 Three actresses in flowing robes that simulate the colors of cherry trees stand on chairs holding cloth lanterns in the shape of birdhouses. From time to time they reach inside them and throw out confetti that resembles cherry blossoms. They converse in Japanese and English and are a chorus to the action presented on the small square raised platform that they encircle. Ms. Winkler’s writing is so simple but exquisite in its execution. In twenty minutes the sad lives of the girls are deftly dramatized with a compelling range of emotion. The direction of John Giampietro is a superb display of the art of stagecraft. The clever fantasy device of the cherry trees is skillfully blended into the narrative with boldness and precision. Lighting, sound and music are all utilized to great effect so that it is all visually quite stunning. Sasha Diamond and Jo Mei are comic, heartbreaking and powerful as the young girls. Don Castro is very charming as a hapless samurai. Kana Hatakeyama, Shiori Ichikawa, and Yurika Ohno are delightful as the stylized cherry trees. The collaboration here between author, director and cast results in a dazzling, miniature epic. The other four plays are all well-written and well performed two-character works that often explored familiar themes to varying degrees of success. 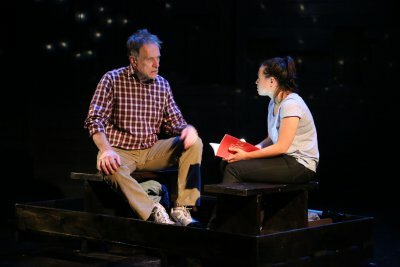 Taking place on rowboat during several annual Memorial Day meetings, The Science of Stars and Fathers and Daughters by Darcy Fowler is a wistful drama about a divorced father and his young daughter. The excellent performances by Michael Cullen and Emma Galvin poignantly depict their characters as they age and cope with life changes. Ms. Fowler’s writing is emotionally effective and compelling. Director Linsay Firman richly realizes the play with the resonant work of the actors and the physical staging that includes the visual tableaus on the boat and the use of lighting to present the stars in the sky the characters refer to. France-Luce Benson’s The Talk is a slight but engaging mother-daughter conflict. Lizan Mitchell’s grand performance as the Haitian mother clashing with her visiting American yoga instructor daughter, fiercely and lovely played by Sharina Martin are the solid anchors of this pleasant work. Elizabeth Van Dyke’s fine direction serves the material well. Mr. Reitz’s plot takes an absurd path that is dependent on an outlandish but remotely plausible coincidence. Director Jules Ochoa expertly assists in rendering this black comedy that aims for pathos as well. 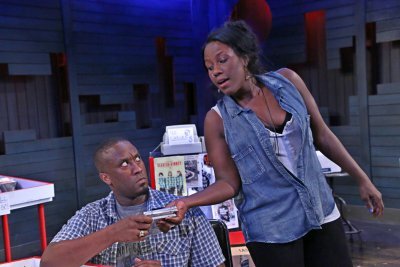 Devil Music is the name of a soon to close Dallas used CD and music store in Angela Hanks’ touching work place drama. Crystal Lucas-Perry and Daniel Morgan Shelley are both charming and intense as the bickering long-time co-workers. Morgan Gould’s direction adeptly captures the sense of place and the character’s mundane lives and lively personalities. The challenge of creating the physical environments for five extremely diverse plays that are performed in succession have been artfully and inspiringly met by scenic designer Nick Francone. All the sets from the music store, the rowboat, a woman’s bedroom, a suburban house, and the dreamy Japanese landscape are beautifully detailed and purposefully assembled, allowing them to be swiftly struck and set up for the next play. Suzanne Chesney’s costumes all express the looks of the many characters realistically. Lighting designer Josh Langman’s work is highly accomplished in producing striking images when needed and subtle when required. Music and effects are strongly conceived by sound designer Julian Evans. The multitude of objects on display and that are used are evidence of props master Justin Cox’s exactitude. With Ensemble Studio Theatre’s 35th Marathon of New One-Act Plays: Series C, this annual series comes to a close. This edition yielded five worthy works that included a vivid masterpiece. Consistently entertaining, but less than the sum of its parts. A botched circumcision instigates a circuitous life journey for the boy, powerfully performed by Bobby Steggert, in this fascinating docudrama. Ciara Atik’s delightful set of one-acts takes a frank look at the motives and consequences behind the world’s most confusing pastime in this Ensemble Studio Theatre/YoungbloodEST production. A gracefully written and beautifully acted drama based on a true story of a surgeon who performed experimental surgery on enslaved women in the mid-1800s.